For over a month ago a private consultant manages the opening of new markets in four to five border cities in Brazil on behalf of the Union of Banana Producers Associations (Unabana). 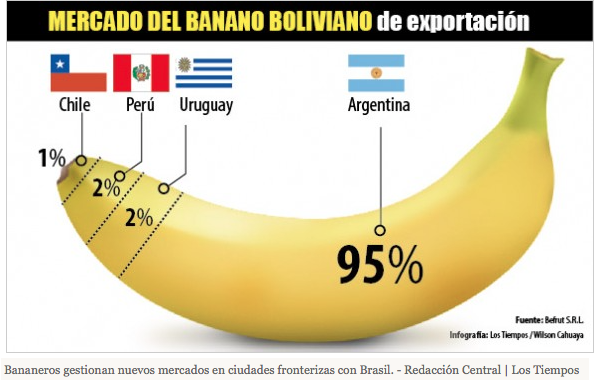 Mérida noted that 95 percent of banana exports are going to Argentina, the 2 percent to Uruguay, another 2 percent Peru and to Chile 1 percent. He explained that Brazil is a producer of bananas, but for reasons of distance does not cater to the border cities with Bolivia, including Rondonia or Corumbá, similar to what happens in Peru. The process is well under way and banana producers already have the draft contract with the Brazilian company Agricampus, which will make the pest risk analysis to determine whether the Bolivian product meets the parameters. If realized, new markets would mean a relief for exporters because “to sell three to five trucks more per week, saves you” said Merida. Even more so now, that industry data indicate that 2014 will close with a record production of over 5 million boxes. In 2013 production reached 4.7 million boxes. The increase in yield and acreage are the reasons. With $22 million dollars through September, banana exports rank second in value in the list of Cochabamba exports, first is natural gas, according to the Bolivian Institute of Foreign Trade (IBCE). Banana production in the Chapare, in the red zone of narcotrafficking has only been made possible due to the work of the CRDP, CORDEP projects, funded by USAID in late 80s to early 90s. When buyer received the boxes, two were filled partially with leaves and mud… to come up with the required weight… many years from that experience… it makes me feel proud to know that Chapare banana exports are second in importance for Cochabamba, and are first ones in renewable production! However, it infuriates me to see all demagogue speeches from both presidents, portraying themselves as socialists, as brothers in ideology and … the result is there… Bolivian current government is absolutely incompetent and truly deserves the title of being an ochlocracy! Unabana is certainly patriot, entrepreneurial and has lots of self-steem, so I welcome them to The Hall of Bolivian Fame! This entry was posted in Bolivia, Business, Cochabamba, Economics, Environment and tagged banana, Brazil, bureaucracy, competitiveness, export market, IBCE, Ochlocracy, public policy failures. Bookmark the permalink.